Just like Scythe, the winner of My Little Scythe is the first player to collect enough trophies. Enough meaning four. There are eight trophies, awarded for different achievements in the game. All players can win the same trophy, no player can win the same trophy twice. Also like Scythe, every turn of My Little Scythe starts with selecting an action on your player board. You can take any of the six actions you want, except the one you took last turn. The action pawn has to move. The six actions are grouped in three sections: Move, Seek, and Make. In Move there is only one action. 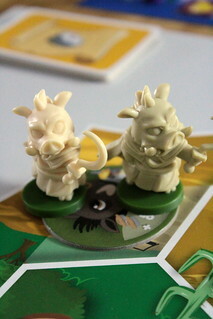 It lets you move both your adorable little animal person miniatures. 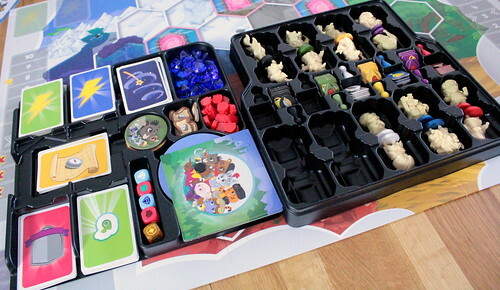 Each of them can either move two spaces unencumbered, or they can move one space and carry any number of apples and magical gems with them, the two types of resources you find on the board. What is interesting about moving is mostly what you encounter along the way. Sounds profound and philosophical, but it’s just a fact. For instance, you could run into one of the six magic portals on the board, and from there take a single step to any other portal. A useful way to travel quickly, but not the most interesting thing to do when moving. 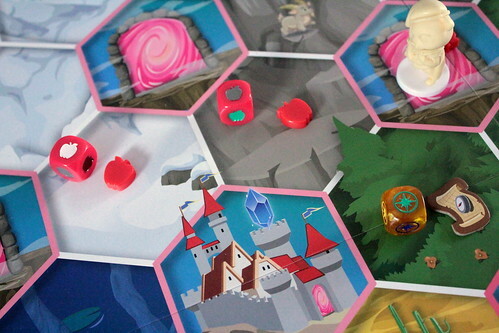 It’s more interesting to move into Castle Everfree, in the center of the board, and deliver four apples or four gems. Why is that interesting? Because there are trophies for both types of deliveries. Just as interesting is moving to a quest marker. When you do, you draw a quest card and decide what to do with that quest. They all have two ways to complete them, usually one where you pay things and gain Friendship and one where you take things and lose Friendship, or you can refuse the quest and only take a small reward for stopping by. Collect two quest cards and you gain another trophy. Almost there already. But the most interesting thing you can encounter is another player. You can’t take the player-versus-player conflict out of a game that should resemble Scythe, but you can make it more cute than deadly. When two animals meet they have a Pie Fight, and the loser has to return to their camp to wash up. Pie Fights are similar to combat in Scythe. Both fighters take a Pie Fight Dial and secretly pick how many pies they will throw. They can also add one or two Magic Cards to add magical pies to their regular ones. Both players reveal their selection, pay the pies thrown on the pie track, and the loser returns to camp. Winning a Pie Fight awards another trophy, but mostly you’ll fight over apples and gems. Even with pies, fighting is not nice, so the attacker loses a point on the friendship track as well. That’s bad because you can’t win trophies if your friendship is too low. No one likes a bully, after all. The second block of actions is Seek. Here you have two options, you either seek apples or gems. The only thing that changes is the dice you roll: two of the type of resource you seek, one of the other type, one quest dice. All dice show six colors to match the six colored terrains on the board. For each dice you place one of the matching resource somewhere in that area. You may place things on your own space, and you may place things on an opponent’s space. That would be a seriously nice thing to do, so you gain a point of friendship when you do. Eight points of friendship, by the way, awards another trophy. Where’d those apples come from? Last, there is the Make section with its three actions. For two apples you can make two pies and get ready for another pie fight – also, another trophy at eight pies. For two gems you get a new Magic Card. Three of those cards in hand, BAM, one more trophy. It wouldn’t be a Scythe game if you couldn’t enhance your actions on your playerboard. That’s the last Make action. For an apple and a gem you upgrade your Move or Make section by placing a tile with special abilities over it. Those are where My Little Scythe has the most variety, because each tile has a different upgrade. A Move upgrade might let you move two spaces even when carrying resources, or teleport one of your minis to a space with unattended resources. Make upgrades can make you more efficient at baking pies, or let you pay any Make action with any resources you want. It’s also worth mentioning that having both upgrades is how you get the eighth and final trophy. As soon as one player has four trophies all other players get one more turn to try and catch up. If they manage ties between players with enough trophies are resolved by having more Friendship, then by having the most remaining resources. The winner ascends the throne of Pomme, all that’s missing is a little crown. The first thing you notice when opening My Little Scythe is the super high production quality. The seven species of animal minis are adorable, the apples and gems are large and satisfying to handle, and everything is illustrated in a style not entirely unlike a certain equine animation series. The inlays are exemplary, they keep everything in place. The only complaint about components would be that the dice, especially the quest dice, are too hard to read. White dice with colored icons would have been a better choice. What about the game, though? If you know Scythe, then you will have no doubt whatsoever about My Little Scythe‘s ancestry. All the core ideas are there, just stripped down to a point where you can play the game in an hour and with any eight year old interested in games. Obviously, some things had to be cut off to make Scythe into Little. 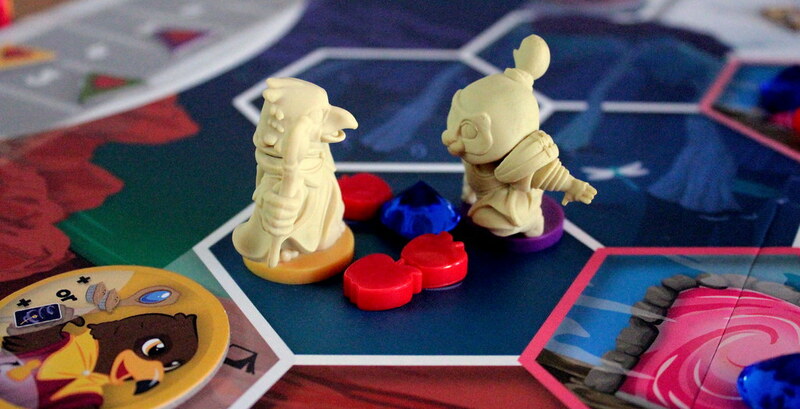 Two upgrades are not the same as the complex development that is the Scythe player board. The number of options in everything is vastly reduced. But, and this is an important but, My Little Scythe still offers a greater strategic variety than most games for that age group. There are not just multiple ways to win. There are multiple ways to achieve almost anything, and it’s rarely a simple decision. Is it easier to attack another player and steal their apples, not knowing what cards they have, or is it better to seek apples and hope some land close to you? I don’t know. You don’t know. But it’s a meaningful decision, and My Little Scythe is full of those. My Little Scythe is not a game for everyone. Single parents with only one kid will be disappointed, because two player games turn out not very interesting. Any other number of players works well, and even with six players the game moves quickly enough. It’s also not going to be a game you get from the shelf for your gamer buddies next Saturday night. There’s not enough meat on the bones for that. But for playing with your family My Little Scythe is not going to drive you crazy with boredom and decisions without consequences. At the same time, it’s not going to frustrate the kids with overly complex rules and consequences they can’t anticipate. That’s a tough balance to strike and My Little Scythe does it perfectly.